I’m quite reluctant to give bacon another 15 minutes of fame. That “meme” has lived out its usefulness, wouldn’t you agree? And yet, it goes so well with so many things, especially if you use it more as a flavoring than as a main event. One of the best (and simplest) of meals in my opinion is leeks fried in bacon drippings, along with a couple of slices of crispy bacon and a poached egg. Or this appetizer — which takes very little effort apart from shelling some fava beans. Pour yourself a glass of white wine, put on a jazz CD and you’ve got yourself a perfect recipe for a relaxing evening. Feel free to substitute guanciale or pancetta instead of the smoked bacon. For best results, make sure that the pancetta is sliced fairly thick. Prepare the fava beans, first by shelling the beans, then by removing each bean’s endocoat. Click here for a walkthrough of that process. Fry the bacon in a large skillet over medium heat. Once the bacon starts to crisp up, add the shallots. Cook for 1 minute, or until they turn translucent. Pour in the white wine, then add the fava beans. Cook until the fava beans have warmed through, about 2-3 minutes. Taste for salt and pepper. Remove pan from heat, stir in some minced chives, then serve at once. This recipe is sized for one person. Can be an appetizer or a side dish. Time: About 40 minutes, including prep. It may take longer, depending on how adept you are at shelling the fava beans. 02 May	This entry was published on May 2, 2013 at 8:02 am. 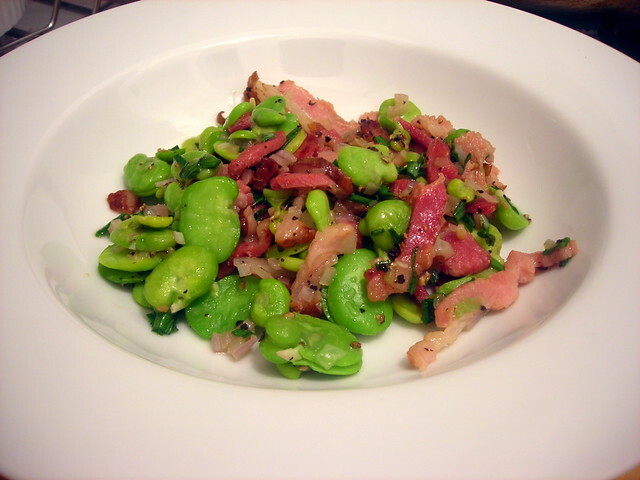 It’s filed under cooking, food, food photography, Gluten-Free, recipe, spring, Union Square Greenmarket and tagged appetizer, bacon, fava beans, food photography, gluten-free, spring. Bookmark the permalink. Follow any comments here with the RSS feed for this post. Oh my. Does it get any better than this…..Not much. Thank you Stash. Sounds excellent – and certainly looks beautiful! I’m sorry I didn’t think of the pancetta ends in the freezer when considering what to do with favas for dinner tonight – but they were good just reheated in butter with salt and pepper.We typically blanch or cook favas in their skins – tonight I started with the big ones, and added a smaller size each minute till the last, so the large ones cooked five minutes and the babies only one. Then they can be popped out of their skins pretty easily. It’s even easier if you slice off the very end of the skin. You can do much the same with spinach or other spring greens. These are fava beans from Fairway, a “chain” supermarket here in NYC. I usually get my fava beans from our farmers’ markets, but those don’t appear until late May/early June.